Large focal beads. Numbered from top to bottom: #1 is a tube bead with an ivory base. Greens, plum, turquoise and black. #2 is a red base bicone with silver, gold and black threads. #3 is a black base bicone with plum, gold, silver turquoise and black threads on the band. 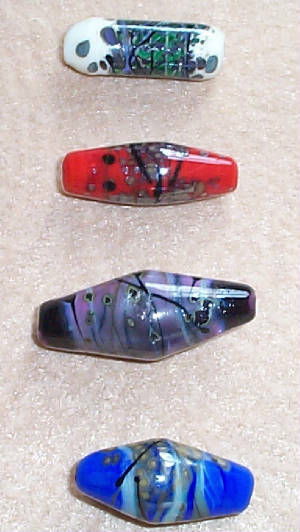 This bead measures about 37mm long X 14mm wide. #4 bead has an opaque cobalt blue base with bands of turquoise, silver, gold, copper green and black threads. This bead is about 28mm long X 12mm wide. Price: $5.00 for each bead.